A BeautyIRL concept shop, one of the innovations recognized by Women’s Wear Daily in naming CVS Pharmacy 2018 Retailer of the Year. Over the past several years, we’ve worked to innovate our CVS Pharmacy beauty department to serve our customers’ needs and provide a next-generation experience, while continuing to position ourselves as an industry leader with the health and well-being of our customers in mind. Now, we’re honored to be recognized for our strides in beauty by one of the industry’s foremost authorities, Women’s Wear Daily, which named CVS Pharmacy the 2018 Retailer of the Year at the publication’s 17th Annual Beauty Inc. Awards. “CVS left no doubts it is serious about beauty and willing to bet big,” WWD said in its 2018 Beauty Inc. Awards issue. Selected based on a variety of criteria, including feedback from retailers and industry analysts, sales data and coverage by WWD throughout the year, the Beauty Inc. Awards recognize the best and most innovative players in the industry. The award was accepted by Maly Bernstein, Vice President of Beauty and Personal Care at CVS Pharmacy, during a ceremony in New York City in early December. “My aspiration has always been to have CVS Pharmacy lead the next revolution in beauty,” Bernstein said. Describing what made CVS Pharmacy its choice for Retailer of the Year, WWD cited the commitment we made starting in 2018 to no longer materially alter the beauty imagery we create for retail locations, marketing materials, websites, apps or social media. This initiative also included the creation of Beauty Mark, a watermark that now appears on imagery to signify that it is authentic and has not been materially altered. Beauty Mark is part of our effort to lead positive change around transparency in beauty and to help customers differentiate between authentic and materially altered imagery. WWD also applauded the expansion of our beauty offerings, including the introduction of more K-beauty products to our shelves, eSalon installations to bring hair services to customers, and, most recently, the reveal of our BeautyIRL pilot stores. 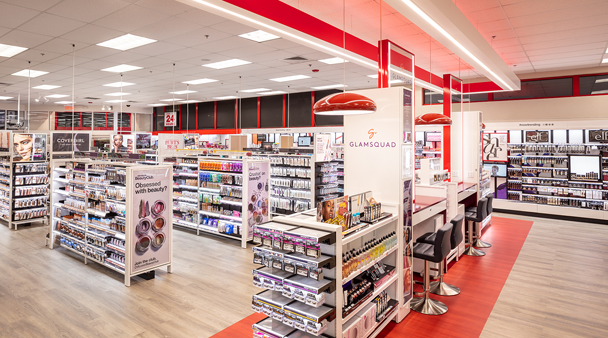 Currently located in four CVS Pharmacy locations nationwide, the BeautyIRL shops include mini beauty services through an exclusive partnership with GlamSquad, as well as an expanded and redesigned beauty department that encourages the discovery of new brands and trends. “We are looking for ways to engage with new, emerging brands so that we can make them more accessible to beauty enthusiasts,” Bernstein told WWD.